Still from promo for Vice on HBO. Though VICE has, in some ways, improved its Africa coverage — see, for instance, its reporting on the political crises in the Central African Republic —it continues to offer some familiar, adventurist, Tarzanist tricks. Think of the infamous “cannibals”-in-Liberia episode, which prompted the late New York Times reporter David Carr to pillory VICE executives for their exoticizing methods. Those affiliated with VICE appear to have learned little from Carr’s blistering critique. Among the worst offenders is its correspondent Thomas Morton. Introducing the segment, VICE CEO Shane Smith (incidentally, he reported the Liberia cannibal episode) offers a strikingly dubious assertion: “For nearly 100 years, Hollywood has essentially had a monopoly on the movie business.” This is not an auspicious beginning, relying as it does upon a number of galling generalizations — the stuff of a film historian’s nightmares. But it also portends the episode’s presentation of a broadly defined, hegemonic Hollywood as the center of global media production — the “norm” against which all filmmakers are necessarily judged. A familiar fallacy — that, because Nollywood equals Nigeria, there are no alternatives in this allegedly totalized and totalizing country — leads to the misplaced assertion that Nollywood is “the second biggest ‘-ollywood’ in the world, after Bollywood.” That VICE is still peddling a 2009 UNESCO report that has long since been discredited by scholars — not to mention complicated beyond recognition by industrial practices in the intervening years — is hardly surprising. And yet Morton, the segment’s host, repeatedly mispronounces “Lagos” as only an American can, initially reporting from the Lagos Civic Center premiere of Pascal Atuma’s Bloodlines (2014). “You’d think that there’d basically be roles for just about everybody,” Morton proclaims. What he doesn’t mention is that open-call auditions, though numerous, are typically only for small roles and are further conditioned by Nollywood’s sophisticated star system as well as by the Actors Guild of Nigeria (formerly operating out of the National Theatre and now dispersed in offices throughout the country). In her valuable book Nollywood Central, Jade L. Miller details the various guilds and trade organizations that structure Nollywood, offering an important counterpoint to the sort of portrayal that VICE provides. Morton’s monologue thus perpetuates a condescending perception of Nollywood as Hollywood’s “lesser,” more “accessible” African counterpart — a lowly industry that even someone with no experience can breezily “infiltrate.” If Morton thinks that it’s easy to “break into” Nollywood as an actor, he would do well to read any number of biographical accounts of the industry’s top stars, the vast majority of whom toiled for years, in a dizzying number of capacities, before becoming household names. What’s more, in her remarkable 2012 memoir Looking for Transwonderland: Travels in Nigeria, the writer Noo Saro-Wiwa debunks the fanciful, tempting notion that Nollywood is somehow able to accommodate anyone who makes it to Lagos. But it is Morton’s reference to Noriyuki “Pat” Morita, the Oscar-nominated star of John G. Avildsen’s The Karate Kid (1984), that is perhaps most instructive. For if Morton believes, however ironically, that he can “be” Pat Morita, he also, apparently, believes that he can “be” Nigerian — at least in an audition in which, wearing fur and wielding a cow’s skull, he rants and raves, spouting “African” gibberish in a manner that would make even Rachel Dolezal’s jaw drop. 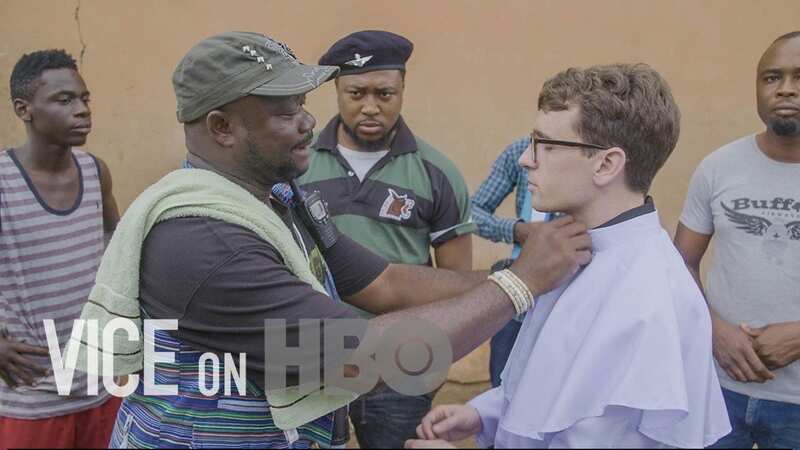 Morton’s next stop is an audition for the legendary filmmaker Lancelot Oduwa Imasuen, who reluctantly hires the American hipster to portray a Catholic priest in his film Love Upon the Hills, which shoots on location in Benin City. One gets the impression that Imasuen was compelled to include Morton, and by extension VICE, in the production of this film. That is not to suggest that Imasuen lacks agency — that he could not have said no. It is simply to indicate that the entreaties of a heavily capitalized, wide-reaching media producer like VICE would be difficult for anyone to resist. Imasuen may well have recognized the importance of publicizing his work, and that of the broader Nollywood industry of which he has long been a celebrated part, for HBO’s massive global audience. While Morton continues to characterize Nollywood in offensive terms, claiming that it “came to ape the West” in terms of “quality of [film] production” — and describing iROKOtv (which he mispronounces) as “your basic African Netflix” — the eloquent Imasuen has an opportunity to describe the industry in his own words, with an insight born of experience, passion and, above all, respect.